Cartoon Network KEN as FRED Scooby-doo Doll Mattel Factory Sealed B3284. Ken doll as Fred with Scooby Snacks, notebook and Scooby-Doo dog! Condition is New. NRFB Shipped with USPS Priority Mail. Scooby-Doo Barbie And Ken set of 4 characters with boxes, in very good condition. Condition is Used. All dolls come complete with their boxes a Scooby-Doo dog and a box of Scooby Snacks. Shaggy and Fred however do not have the colorful insert that goes inside the Box. Daphne and Velma do have the color inserts in the boxes. Great collector's item. There is some wear to the boxes and the characters. They all at one time or another have been removed from the boxes and gently played with. Mattel Scooby-Doo Daphne. Condition is New. New Listing2002 Scooby Doo Ken as Shaggy Barbie NRFB. 2002 Scooby Doo Ken as Shaggy. The box shows minor wear from age and storage. I do my best to describe all flaws and/or defects in words and with photos. Skipper as Velma (B3282). Barbie as Daphne (55887). Ken as Shaggy (B3283). New From 2002 -Set of 4 Scooby Doo Barbie Dolls. No.55887 NRFB. 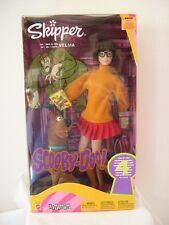 Scooby - Doo Daphne Doll. However, most international orders do arrive within 3 weeks. BARBIE AS DAPHNE FROM SCOOBY DOO! NEW IN PACKAGE DATED 2002 MATTEL. Condition is New. Shipped with USPS Priority Mail. Daphne and Scooby Doo - Excellent condition - no marks - scratches - sold as is - see pictures with accessories. BARBIE DOLL DAPHNE SCOOBY DOO 2 MONSTERS UNLEASHED. Look for more rare Barbie dolls and other collectibles. Box is in good condition. Condition is New. Shipped with USPS Priority Mail. The box may show signs of wear . Please look and all the pictures. I buy my items from many places and cant guarantee they came from a pet free smoke free home. Some of the accessories may be loose in the box. If u have any questions or need more pictures please ask before purchasing . Thanks . I try my best to describe my items. SOLD AS IS. Up for your consideration is a Scooby Doo Barbie Daphne Doll Pink Dress New IN BOX with Scooby Plush. Condition is New. The box may show signs of wear . Please look and all the pictures. I buy my items from many places and cant guarantee they came from a pet free smoke free home. I am a smoke free cat friendly home. Some of the accessories may be loose in the box. If u have any questions or need more pictures please ask before purchasing . Thanks . I try my best to describe my items. SOLD AS IS. This doll is adorable. She is in MINT condition. This is great for any Scooby-Doo fan! Removed from box for picture, Porcelain head, hands and feet, cloth body. This is Barbie as Daphne from Scooby Doo 2001 Red hair Barbie with accessories plus a stuffed, cloth Scooby Doo included. Barbie Scooby-Doo Lot. Condition is New. Shipped with USPS Priority Mail. Contained in this lot are the following Barbies: Scooby-Doo Skipper Velma Scooby-Doo Ken Shaggy Scooby-Doo Barbie Daphne Scooby-Doo Ken Fred Scooby-Doo Monsters Unleashed Daphne Like new never opened. Please see pictures for condition of item. Feel free to contact with any questions or concerns. Gorgeous doll, mint condition. Bendable legs. Comes with a Barbie collectibles doll stand. Stephanie and her pal scooby doo Doll in pre-owed condition, well kept displayed only. Please review all photos before placing your bid any questions please feel free to ask and I will try to answer them to the best of my ability. Winning bidder must pay for item within two days of winning. Customer satisfaction is always my first goal any questions or concerns please contact me before leaving any feedback. Thanks and good luck bidding. Scooby-Doo! Barbie as Daphne AND Ken as Shaggy. Both come with stuffed Scooby. Never opened, new in box. In great condition. Boxing is slightly bent but doll is in new condition. SKIPPER AS VELMA. -KEN AS SHAGGY. -BARBIE AS DAPHNE. Velma - Skipper Doll. Monsters Unleashed Daphne. Daphne - Barbie in Purple Dress. Shaggy - Ken Doll. Lot of 5 Scooby Doo Dolls. Fred - Ken Doll. Barbie Scooby Doo Where Are You?. Monsters Unleashed Daphne SCOOBY DOO Barbie Doll NRFB ~ Very Good Box "
Help Barbie solve the mystery with the gang! Produced in year 2000. This listing is for a brand new 4-1/2" 2003 Mattel Scooby-Doo Shaggy doll! Please see our photos for best assessment, and feel free to ask any questions you may have before making your purchase. Ken is dressed like Shaggy from Scooby-Doo. Released 2003. Excellent condition, (both) doll and box. Doll never out of the box. This is a New Mint Doll in Original Box. The Box appears to be in Mint Condition. She is 11 1/2" tall. JUST ACTUAL COST! So if you can find a better deal all around, go for it, I would! I know alittle bit about a lot of things, but an expert on nothing! This is 2000 Barbur in Scooby-Doo, where are you! The Great Amusement Park Caper doll made by Mattel #27966. It is brand new, it was stored when purchased. Please let me know if you have any questions. Thanks!! Mint Condition! Trending at $35.83eBay determines this price through a machine learned model of the product's sale prices within the last 90 days. Velma - Skipper Doll. Daphne - Barbie in Purple Dress. Shaggy - Ken Doll. Lot of 4 Scooby Doo Dolls. Fred - Ken Doll. creasing, edge wear, sticker residue, dents, etc. Dolls great to take out for play or display. Lot of 4 Kelly/Tommy Scooby Doo Dolls. Never Removed From Boxes. Boxes are in very good condition with light shelf wears. Local Pick Up can be arranged. New in box; has never been opened. Box has minor scrapes on cardboard on the sides. BARBIE SCOOBY DOO KEN AS SHAGGY. in on pictures to see. Barbie As Daphne Doll 11 1/2" & Scooby Doo 2001 3+ New MIB #55887 Cute! It is in good used condition as shown, never played with. We tried several photos but can not elimate the glare. She is a great gift or nice for your collection. Trending at $23.64eBay determines this price through a machine learned model of the product's sale prices within the last 90 days.